A swarm of 10,000 or more black holes may be orbiting the Milky Way’s supermassive black hole, according to results from NASA’s Chandra X-ray Observatory. This would represent the highest concentration of black holes anywhere in the Galaxy. 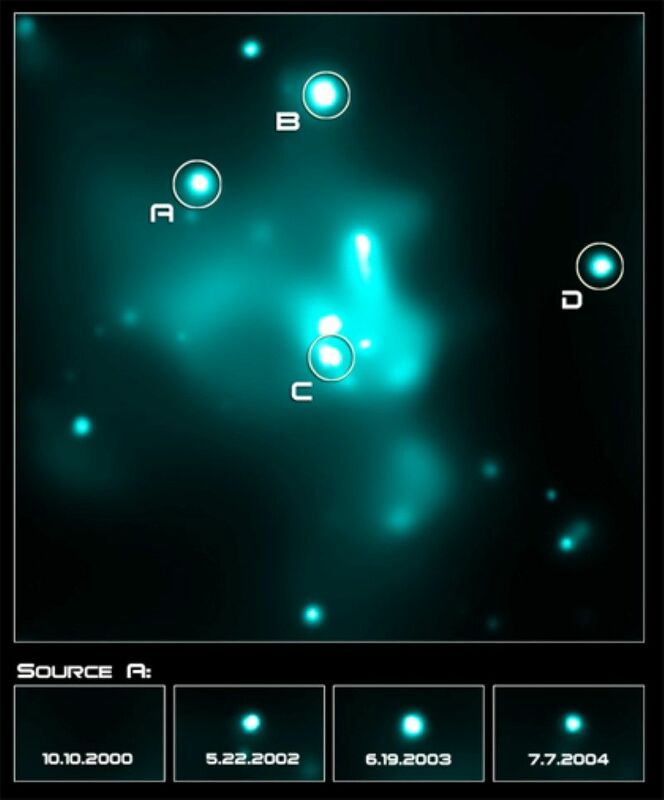 These relatively small, stellar-mass black holes, along with neutron stars, appear to have migrated into the Galactic Center over the course of several billion years. Morris had predicted a decade ago that a process called dynamical friction would cause stellar black holes to sink toward the center of the Galaxy. Black holes are formed as remnants of the explosions of massive stars and have masses of about 10 suns. As black holes orbit the center of the Galaxy at a distance of several light years, they pull on surrounding stars, which pull back on the black holes. The net effect is that black holes spiral inward, and the low-mass stars move out. From the estimated number of stars and black holes in the Galactic Center region, dynamical friction is expected to produce a dense swarm of 20,000 black holes within three light years of Sgr A*. A similar effect is at work for neutron stars, but to a lesser extent because they have a lower mass. Once black holes are concentrated near Sgr A*, they will have numerous close encounters with normal stars there, some of which are in binary star systems. The intense gravity of a black hole can induce an ordinary star to “change partners” and pair up with the black hole while ejecting its companion. This process and a similar one for neutron stars are expected to produce several hundreds of black hole and neutron star binary systems. The black holes and neutron stars in the cluster are expected to gradually be swallowed by the supermassive black hole, Sgr A*, at a rate of about one every million years. At this rate, about 10,000 black holes and neutron stars would have been captured in a few billion years, adding about 3 percent to the mass of the central supermassive black hole, which is currently estimated to contain the mass of 3.7 million suns. The black hole at the center of our Milky Way Galaxy is a monster that contains about 4 million times more material than our sun. But compared to the giant black holes in the centers of other galaxies, our black hole is strangely quiet. Light echoes are similar to the sound echoes we hear when sound waves reverberate in a room or valley. In the case of light echoes, the X-rays produced by the giant outburst have been racing outward across trillions of miles of space at the speed of light. Three hundred years later, they have traveled far enough that they reach a giant gas cloud known as Sagittarius B2. Once they penetrate this cloud, they heat up the gas, and cause it to glow brightly in X-rays. But once the X-rays pass through the cloud, it cools down, and its brightness fades back to normal. Sagittarius B2 acts like a giant mirror. The light echoes inside the cloud give astronomers a record of the black hole’s energy output 300 years earlier. By using Japan’s Suzaku and ASCA X-ray satellites, NASA’s Chandra X-ray Observatory, and the European Space Agency’s XMM-Newton X-ray Observatory, Inui’s team could observe the behavior of the cloud. It takes light from the Milky Way Galaxy’s center about 26,000 years to reach Earth, so when astronomers observe the black hole and the gas cloud, they are actually seeing events that took place 26,000 years ago. At that time, Earth was still plunged in the last ice age, and humans were living in caves. Astronomers don’t know why Sagittarius A* produced such a powerful flare three centuries ago. One possibility, says Koyama, is that a giant star exploded. The blast wave from the explosion plowed up gas and swept it into the black hole, leading to a temporary feeding frenzy that awoke the black hole from its slumber and produced the giant flare. On September 14, 2013, astronomers caught the largest X-ray flare ever detected from Sagittarius A* (Sgr A*) shown in the image at the top of the page. This event, which was captured by NASA’s Chandra X-ray Observatory, was 400 times brighter than the usual X-ray output from Sgr A*, as described in our press release. The main portion of this graphic shows the area around Sgr A* in a Chandra image where low, medium, and high-energy X-rays are red, green, and blue respectively. The inset box contains an X-ray movie of the region close to Sgr A* and shows the giant flare, along with much steadier X-ray emission from a nearby magnetar, to the lower left. A magnetar is a neutron star with a strong magnetic field. A little more than a year later, astronomers saw another flare from Sgr A* that was 200 times brighter than its normal state in October 2014. Astronomers have two theories about what could be causing these “megaflares” from Sgr A*. The first idea is that the strong gravity around Sgr A* tore apart an asteroid in its vicinity, heating the debris to X-ray-emitting temperatures before devouring the remains. Their other proposed explanation involves the strong magnetic fields around the black hole. If the magnetic field lines reconfigured themselves and reconnected, this could also create a large burst of X-rays. Such events are seen regularly on the Sun and the events around Sgr A* appear to have a similar pattern in intensity levels to those. Researchers have been using Chandra to monitor Sgr A* since the telescope was launched in 1999. Recently, astronomers have been closely watching Sgr A* to see if the black hole would consume parts of a nearby cloud of gas known as G2 and cause flares in X-rays. Due to G2’s distance from Sgr A* at the time of the September 2013 flare, however, researchers do not think the gas cloud was responsible for the spike in X-rays. In addition to the giant flares, the G2 observing campaign with Chandra also collected more data on the magnetar located close to Sgr A*. This magnetar is undergoing a long X-ray outburst, and the Chandra data are allowing astronomers to better understand this unusual object. Scale Image is 1 arcmin per side.